We’d love your help. Let us know what’s wrong with this preview of Sanctuary by Jennifer McKissack. After the untimely death of her aunt, Cecilia Cross is forced to return to Sanctuary, a rambling, old mansion that crowns a remote island off the coast of Maine. Cecilia is both drawn to and repulsed by Sanctuary. The scent of the ocean intoxicates her, but she’s also haunted by the ghosts of her past—of her father and sister who died there, of her mother who was torn away After the untimely death of her aunt, Cecilia Cross is forced to return to Sanctuary, a rambling, old mansion that crowns a remote island off the coast of Maine. Cecilia is both drawn to and repulsed by Sanctuary. The scent of the ocean intoxicates her, but she’s also haunted by the ghosts of her past—of her father and sister who died there, of her mother who was torn away from her and sent to an asylum, and of the vengeful spirit of a woman wronged. Flooding memories leave Cecilia shaken, desperate to run away and forget her terrible family history. I struggled to get through this book at first. It started slow and the plot was not very clear. When it became clear, it wasn't that interesting. I felt the book was weird and that's really the best way I can describe it. It's unlike anything I've read before. However, I think the author was successful in writing for the time and setting, and also writing an original story. If you like hauntings and slower books, this is for you. However I would not personally recommend this to anyone. An intriguing YA read that could pass for an adult read. Filled with mystery, the story centers around Cecelia who sent away as a young girl returns to her once grand home only to find a presence that does not want her there. My only thing about this book that fell flat for me was the ending, it ended abruptly and left me unsatisfied. This book had a little bit of everything. It was part ghost story, part mystery/suspense, part love story and part historical fiction. Although it seems like an odd and busy combination it actually worked quite well. McKissack did a fabulous job in describing the setting of this book and Sanctuary. It was easy to visualise the Island and the old Gothic mansion. I felt like I was there and that I was a part of it. As the reader I was able to feel how eerie and creepy the mansion and graveyards were. I could feel the wind and the ocean right along with Cecilia. This book tells a few stories. First is Cecilia's return to Sanctuary and her struggle to discover who she is and where she fit in. It also explores what first young love feels like. During this struggle it tells the haunting story of her father, Grandmother and sister who are all deceased and her mother who has been committed. Finally it tells the story of the ghosts that have been haunting the Island, mansion and Cecilia. These stories are all woven together in one mysterious and haunting package. I really liked the ghost story and historical aspect of this story. In fact, I would have liked more of it. I already knew a bit about the Acadian history but it was interesting to read a story surrounding it. An entire story about this could have kept my interest alone. I also liked the sweet and squeaky clean budding relationship between Cecilia and Eli. It was sweet to read. The book did start out quite slow and it took me a while to get into it. It was great once I got there but it took a while. While I found the historical aspect quite interesting, I do feel like younger readers may find it a little dull. I also found that the ending was a little anti-climatic as well. Over all, I enjoyed this story and am glad that I had the opportunity to read it! I think this book has flown under the radar a bit which is a shame because it's fantastic! As a YA historical fiction with a touch of the supernatural it is a bit of an unusual story with the main character Cecelia living in The Great Depression of the 1930's and a ghost story with it's roots in the Acadian Expulsion of the 1750's. I'm ashamed that as a Canadian I didn't really know what the Expulsion was and am absolutely horrified by this dark piece of our history. The descriptions of how the I think this book has flown under the radar a bit which is a shame because it's fantastic! As a YA historical fiction with a touch of the supernatural it is a bit of an unusual story with the main character Cecelia living in The Great Depression of the 1930's and a ghost story with it's roots in the Acadian Expulsion of the 1750's. I'm ashamed that as a Canadian I didn't really know what the Expulsion was and am absolutely horrified by this dark piece of our history. The descriptions of how the Acadians were treated is heartbreaking and sickening and the fate of our ghost, Amoret, is every woman's worst nightmare. The creepy, Gothic mood is lightened by a very sweet romance and a few solid female friendships. As many women of her time Cecilia is caught in a terrible situation with total dependence on her abusive uncle. She is quite clever and strong and I cheered her on as she attempted to gain some power over her own life. In the end everything is explained and it all wraps up very nicely. I was satisfied with the ending although it wasn't what I was expecting. Thankfully Jasper the dog wasn't forgotten because I was worried for him the whole time. You know you're an animal lover when you are concerned for a fictional pet! I stand at the edge of the shore, and wish that I could lift away the sea foam and let it curl and lap at my toes as my slippers. I want to wander deep into the salty waves, up to my neck, and let all the deep, hidden creatures wonder at my feet even as I crane my head downward to see them as they go by: wispy shadows and occasional will o' the wisp, luminescent flashes from way down below. If there is anything that is better than actually wading in the sea, though, it I have always loved the sea. If there is anything that is better than actually wading in the sea, though, it is reading a book that gets that wistful and occasionally dark atmosphere. And if there is anything that Sanctuary excels at it, it is a wistful and a dark atmosphere - waves of it. This is one of those titles where you wish you could have had it all, but also feel that you can be happy enough with what you've gotten: skeletons in the family closet, elegantly positioned historical references, and enough Gothic twists and turns that it made my ever-yearning heart near giddy with satisfaction. The writing is occasionally awkward and I would have liked more show rather than tell (also, explanation for some of the ensemble characters' motivations), but the lingering sense of salt on my tongue and something hovering over my shoulder makes it all worth it. Of note: Death. I don't think that should bother anyone, but death is almost a character in itself within this story. There are references to mental illnesses and asylums, along with the archaic manner of addressing the former at the time, and the horrific practices rife in the latter. I found this hard to get into and lost interest quickly. I think I struggled with the writing style because it didn't feel gothic or spooky to me at all. This is a really fascinating, if not a bit overlong and not entirely fluid, gothic YA novel. It's got one of the most uninspiring covers I've seen in a while that offers absolutely no insight into the story and does not hint at all about how atmospheric it is. Ceceila's returned to Sanctuary, the big home on the island off Maine, where she's been told not to return. But she feels like she has to, and when she's there, she begins to experience the sorts of strange, haunting experiences that plague This is a really fascinating, if not a bit overlong and not entirely fluid, gothic YA novel. It's got one of the most uninspiring covers I've seen in a while that offers absolutely no insight into the story and does not hint at all about how atmospheric it is. Ceceila's returned to Sanctuary, the big home on the island off Maine, where she's been told not to return. But she feels like she has to, and when she's there, she begins to experience the sorts of strange, haunting experiences that plagued her mother (now locked up in an insane asylum), her sister (now dead), and her grandmother (also dead). Slowly, we learn more about the girl whose ghost haunts them, unraveling into a centuries-long history of Sanctuary, of how men treated the women in their life, and the role of the Great Acadian Expulsion played in how lands, places, and people found "home." Readers who love gothic, atmospheric work will fall right into this. There is quite a bit of distance between the character and the reader, but seeing this book is set at the height of the Great Depression and we're not entirely sure what is going on with Ceceila's experiences, this distance is okay. There is a little bit of romance here, but it's not driving the plot nor the character development at all; Ceceila doesn't give up what answers she's looking for because of Eli's presence. And she certainly doesn't depend upon him to do her work for her. An interesting story about lineage and history, as well as the sorts of ghosts and haunted legacies in our individual and collective experiences. Readers who like books like REBECCA or who have enjoyed the book (and the movie...) THE WOMAN IN BLACK will want to pick this one up. This would also be a pretty good read alike for fans of LONG LANKIN. It's not midnight yet and I'm done!!! So proud of myself!!! This book has potential but man does my head hurts. This review has been hidden because it contains spoilers. To view it, click here. After her Aunt Laura's recent death, Cecilia's uncle has come to retrieve her from boarding school and take her home again to Sanctuary, her uncle's estate that holds more than just memories. Even the local townsfolk are convinced that the isolated island mansion contains trapped spirits. Cecilia's entire family is, or rather, was tied to Sanctuary. Her father killed himself when he was young, just after the stock market crashed and his entire fortune was lost. After the loss of her husband, her After her Aunt Laura's recent death, Cecilia's uncle has come to retrieve her from boarding school and take her home again to Sanctuary, her uncle's estate that holds more than just memories. Even the local townsfolk are convinced that the isolated island mansion contains trapped spirits. Cecilia's entire family is, or rather, was tied to Sanctuary. Her father killed himself when he was young, just after the stock market crashed and his entire fortune was lost. After the loss of her husband, her mother was put away into a local psychiatric hospital, and Cecilia hasn't seen her since. Not long after this, her grandmother and her elder sister perished suddenly when the cottage where they were spending the night caught fire. To keep her safe, Cecilia's aunt sent her away to boarding school, but now, with her death, Cecilia must return at the whims of her uncle. Many things have changed in her absence. The cook, Anna, is her uncle's new bride, and Anna's nieces, Patricia and Mary, have come to live and work. Her cousin Ben is more reticent than usual and seems to be hiding a secret. A visitor, local professor Eli Bauer, has come to Sanctuary to study and possibly buy rare books from the library. Despite these changes, Cecilia still feels she's living very much in the past: hearing her sister's whispers, seeing fairy lights, discovering the legacy of a woman killed at Sanctuary long ago. As Cecilia tries to piece together the secrets of Sanctuary with that of her own family, she also grows closer to Eli and runs the risk of raising her uncle's deadly ire. Once he might have been a loving man, but now Cecilia more than suspects his cruel nature, especially since she believes he might have had everything to do with her mother's commitment. However, much more evil forces are at work as Cecilia learns more about Amoret, Captain Winship, and the true nature of Sanctuary. Is it really a house filled with spirits? If so, Cecilia is the only one left to make things right, but her risks are many as missteps could mean she's declared mad, possibly harmed by her uncle, or worse, claimed--as her family before her--by the malefic phantasms occupying Sanctuary. This review has been hidden because it contains spoilers. To view it, click here. I was surprised that this book did not get better reviews. I really enjoyed it. I will say that if you look at it as anything other than a ghost story you may be disappointed. It does have historical fiction elements which I thoroughly enjoyed and make the story interesting and drive the plot to believability but it is first a ghost story. When viewed through that lens I believe more people would value the smart, deep plot line that sometimes lacks in that genre. Well done. I wish I could give Sanctuary four stars. The writing is beautiful and mature, particularly for a YA novel, and the chilly coastal-New-England atmosphere McKissack creates is delightful, perfect for a Gothic tale like this one. Cecelia is also a memorable and sympathetic heroine with whose plights I really sympathized. Alas, for all its high points, Sanctuary is little more than a paint-by-numbers Gothic story. That is not to say it’s bad–it’s not at all. It’s quite entertaining, sometimes edge-of-your-seat reading, though something about the pacing and writing style prevents it from being truly riveting. There are a variety of interwoven mysteries that do get somewhat confusing, and they check off all the Gothic fiction boxes: big, spooky, probably-haunted mansion (that happens to be on a deserted island)? Check. Crazy lady in the attic? Check. Ghosts? Possible murders? Dark family secrets? Check, check, check. Yet overall, the plot was underwhelming. It was trying to be big and significant, but it just wasn’t. The pace also vacillated wildly from too slow to much too fast, and even though I was invested in the story, that kept throwing me. (For instance, in the course of two very short chapters, Cecelia goes from being at Sanctuary to being in Nova Scotia. I had to read them twice, all the while thinking, “Wait, what just happened?”) Most of the Gothic elements worked well enough together, but once the larger plot was revealed, they seemed overly dramatic–things used to up the ante of a sort of an overall story that was lacking. There were also so many of them, so much backstory, that the novel really should have been longer. Three hundred pages–small type or not–was not enough to encompass everything. As I said, I did like Cecelia, and her love interest Eli was pretty cute at times. They had a somewhat charming love story, even if it felt rushed (but it isn’t instalove!). I was, however, much more interested in Ben, Cecelia’s supposedly mentally handicapped cousin and honestly I kind of shipped him with Cecelia. The rest of the Sanctuary characters were pretty dull, namely Cecelia’s over-the-top evil uncle, Frank. He had literally zero redeeming qualities; he was just a caricature of a paranoid, sexist asshat. Even factoring in the “bad influence” that Sanctuary and its ghosts had on him couldn’t make him one jot more sympathetic. I wish characters like Cecelia’s old governess, Miss Owens, and her mother had been more developed and given more space in the book. They at least had personalities. Of all her struggles, Cecelia’s fears about “inheriting” her mother’s supposed insanity struck a particular chord with me. My own mother has grown up to be a lot like my grandmother in her habits and personality, and since my mother is also alcoholic and very manipulative and cruel at times, I worry–quite a lot–that someday I’ll be like that. As is usually the case, however, the actual process of uncovering the mysteries was far more exciting and compelling than the solutions to them were. The climax was extremely rushed–the last hundred pages were rushed in general, in fact–and felt just like every other paranormal/Gothic YA novel I’ve ever read. It all felt too easy, too neat, too fast. There was no resolution, either, just an abrupt final page. So even if the rest of it had gotten four stars from me, the ending probably would have bumped it down to three. Too many things worked against this book. I think the one I struggled the most with was pinning down what era the book was talking place in, as some scenes seemed way in the past and others straight out of the roaring 20s and then a few post-Great Depression and even some that felt alarmingly recent. I think the romance worked out well, and I felt emotionally connected with the pair. So that was good. Another thing I began to realize was that information was relayed back and forth, but I could ne Too many things worked against this book. Another thing I began to realize was that information was relayed back and forth, but I could never recall the MC obtaining that information. This could have just been me, but I definitely felt like clues and facts were popping out of nowhere. The last thing would be the pacing of the story. I did enjoy most of what was written, but when I got to the end of the book I realized that a huge bulk of the book could have been cut and nothing would really have been lost. There was all this build up with an extremely rushed ending. Seriously, the climax was maybe one paragraph, and then two more pages and the book ended. This book is interesting with it's concept but I feel the execution of the book just falls flat a bit. The storyline is interesting. How spirits can effect us and how history can be so rich. I had an issue with how short the chapters were. I feel like some of those chapters could have been combined. Some chapters were only one side of a page. The last few chapters I feel were rushed to be finished. It was as if Jennifer McKissack decided to just hurry it along and get the story over with. Maybe This book is interesting with it's concept but I feel the execution of the book just falls flat a bit. The storyline is interesting. How spirits can effect us and how history can be so rich. I had an issue with how short the chapters were. I feel like some of those chapters could have been combined. Some chapters were only one side of a page. The last few chapters I feel were rushed to be finished. It was as if Jennifer McKissack decided to just hurry it along and get the story over with. Maybe a longer few chapters, an additional chapter, something else. The concept was great at the end, but too rushed. Total Gothic fun! And set in Maine (my favorite place on Earth), this book is packed with all sorts of intrigue and family secrets. I learned too about the Great Expulsion of Acadians in the 1750s...a dark piece of history that had remained unknown to me. Grade 7 and up. Will appeal to girls primarily. A ghost story, a strong leading lady and a dash of (chaste) romance. Highly recommended. Surprisingly good and perfect for a quiet October, supernatural read. Fun gothic YA read. The plot did not go the direction I thought it would go but I still enjoyed it. The end was strange to me and anti-climatic. Enjoyable historical ghost story for YA. I stayed a bit removed from the characters and events, tho. Couldn't quite connect. I will recommend for student readers. This is a solid 4.5 stars. I loved this book. The author did a great job of combining three stories: Cecilia’s return to Sanctuary and her struggle to make sense of her memories; the haunting story of her father, grandmother, and sister’s restless soul This is a solid 4.5 stars. I loved this book. Gothic, haunting, and eerie. Sanctuary immediately draws the reader into the mystery of Cecilia's family mansion, Sanctuary. Cecilia feels this un-explainable draw to Sanctuary's grounds, the sheer unusual circumstances of her return and the death of her family members peaked my curiosity. The haunting beginning had me flipping through pages but the plot began to slow and focus on the budding relationship between Eli and Cecilia. While the reader still slowly learns more about the underlying ghosts of Sanctuary, the details are blended throughout the pages filled with character building, romance, and descriptive imagery. The descriptive imagery paints an eerie yet hauntingly beautiful scene that slightly reminds me of older (not too scary) ghost stories. Even though there are some evil spirits lurking around the grounds, Sanctuary is not horror story, at its core its a good versus evil story. Cecilia, now almost 18, has returned to her island home (Sanctuary) after the death of her aunt. Both her uncle and the brooding air of malevolence are worse since she went to boarding school 5 years earlier. Cecilia feels compelled to understand the mysteries of the island and its ghosts, including the deaths of her sister and grandmother, even though her uncle claims she is mad like her mother and threatens to commit her to the insane asylum, also. Cecilia's plans are complicated by the young professor who is studying the valuable books in the library. Men looked at her. And she had something else. Some call it confidence, and it was kind of that. But it was also like she was testing herself. Pushing the boundaries —and not because she wanted people to admire her for it, nothing like that. She wanted to see if she could, to know that she could. She liked being on the edge of life, putting herself in that place where she could topple off if she stepped too far. She burned the brightest right there, jazzing it up at the edge. So bright she blinded everyone around her so that they wanted to be lost in the music with her. Loved this book!! An interwoven tangle of love, lust, betrayal, hatred, rage, families drawn together and families thrown apart. Faced with a life altering decision, which path will she choose? Will she choose forgiveness or revenge? Cecilia returns home – to the place that draws her down deep in her soul, Sanctuary. An odd and ironic name for a home haunted by the brutality of the past. The death of her sister, her father, her grandmother. The madness of her mother. But the sorrow is not restric Loved this book!! An interwoven tangle of love, lust, betrayal, hatred, rage, families drawn together and families thrown apart. Faced with a life altering decision, which path will she choose? Will she choose forgiveness or revenge? Cecilia returns home – to the place that draws her down deep in her soul, Sanctuary. An odd and ironic name for a home haunted by the brutality of the past. The death of her sister, her father, her grandmother. The madness of her mother. But the sorrow is not restricted to the recent past. The pain weaves a pattern through the family history. Cecilia must face the pain of the past and write the future. Of course, nothing comes easy and she must be strong in her decision, risking her own love, life and future. What choice would you make? Taking the easy path or the dangerous hike all uphill? Sanctuary is the name of the old mansion on a remote Maine island where Celia grew up. Her mother was committed to an insane asylum, and after the deaths of her sister and grandmother, she was sent to a boarding school. Forced to leave school at age 17, she returns to the home of many memories, and what feels like the ghosts of the past. Despite her cruel uncle's threats, she digs into her past, trying to understand her family history. One bright spot is the presence of guest Eli Bauer, a profes Sanctuary is the name of the old mansion on a remote Maine island where Celia grew up. Her mother was committed to an insane asylum, and after the deaths of her sister and grandmother, she was sent to a boarding school. Forced to leave school at age 17, she returns to the home of many memories, and what feels like the ghosts of the past. Despite her cruel uncle's threats, she digs into her past, trying to understand her family history. One bright spot is the presence of guest Eli Bauer, a professor examining the family's library for possible purchase. This was a weird book. At first, I thought her uncle did something bad which was why he didn't want her to come back to Sanctuary. The more I read, the weirder it got. All of a sudden there was ghosts and fireflies that weren't really fireflies. I liked Cecelia and Eli together. I felt like the end of the haunting came and went so fast though. It was such an easy fix. I wouldn't read this book again. This book was absolutely amazing. I was so caught up in it that at night time it seeped into my dreams and during the day the characters Amoret, Eli, Cecelia all of them were with me. Its a very satisfying read and left me wanting to read more like it. I am a fan of history, hauntings, and houses with a life of there own. 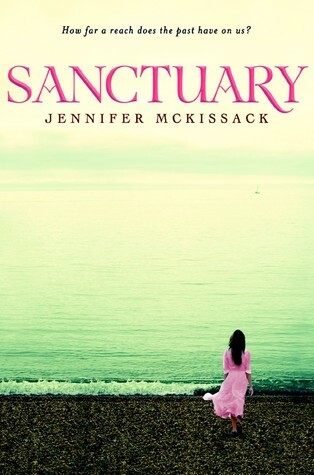 Jennifer McKissack is the author of Sanctuary. She lives not too far from the sea.